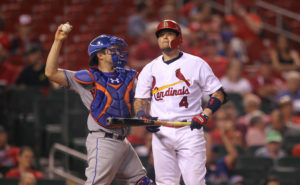 The struggles for the St. Louis Cardinals at Busch Stadium continued Tuesday night with a 7-4 series opening loss to the New York Mets. The Cardinals are just 28-34 at home this season, compared to 38-24 away from Busch. Jamie Garcia struggled, lasting only four innings in taking the loss. The Mets were able to tag the Cardinals starter for three runs in the first, two more in the second, and one in the fourth. St. Louis did respond with three of its own in the bottom of the first but the rough start proved to be too much to overcome. Randall Grichuk smashed a solo homerun in the loss for St. Louis. The Cardinals still hold the NL’s second Wild Card spot with a game and a half lead over Miami.